This easy braised beef recipe is made with lots of carrots. Braising meat calls for a long slow cooking, so be sure to start this recipe in the afternoon. The smell will have everyone happily anticipating dinner. Here in France, boeuf aux carottes is not only a popular way to soften up tougher cuts of beef, it's also a slang term that refers to the police who investigate the police, the IGS, or Inspection Générale des Services. There are several popular explanations for this term, one being that the IGS allow the police they are investigating to simmer for a long time during investigation. Many recipes for this traditional braised beef recipe call for a calf's foot. I'm afraid that veal is where French food and I are forced to part ways, so I've not included the pied de veau. The foot would add a certain amount of flavor, but is mainly included for the gelatin it contains. This gelatin would of course thicken the sauce somewhat. The recipe was still very tasty all the same, but maybe I don't know what I'm missing! This cooks perfectly in a Dutch oven, and once again I had the pleasure of using my Staub cookware, which I recommend to one and all. The first time I made this, I added the carrots right at the start. I thought this made them a bit too mushy, so I've changed the recipe to call for adding the carrots after the beef has cooked some. This braised beef recipe goes well with mashed potatoes, but you could also serve it with rice or just a good loaf of French bread. Heat the oil and butter in a Dutch oven or similar heavy pot on medium heat. Add the beef and brown on all sides. You may need to do this in two batches. Remove the beef from the pot and add a bit more olive oil if needed. Add the chopped onions and cook, stirring occasionally, until soft, about 7 minutes. Add the white wine, and stir using a wooden spoon to scrape off any bits from the bottom of the pot. Add the meat, the beef bouillon, the pepper and the thyme and bay leaves. (You may wish to tie the herbs into a bouquet garni). Bring the mixture to a boil, then cover the pot with a tight fitting lid and reduce heat to low. Simmer the beef for two hours. At the end of two hours, stir in the carrots, and cook for at least one more hour. 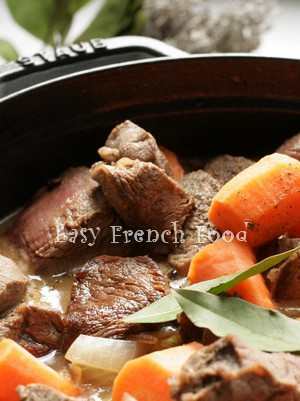 You can safely simmer the beef for longer and it is particularly good reheated the next day. You may need to add a bit more liquid as it is cooking if your lid is not air tight.